A.M. was originally created in 1993 as an outdoor sculpture. The structural elements of its construction are intended to contrast with the natural elements of its surroundings. Later on in the history of the work, McCue added the “5” design on the bricks as somewhat of a nod to the industrial-type abstractions of Charles Demuth. 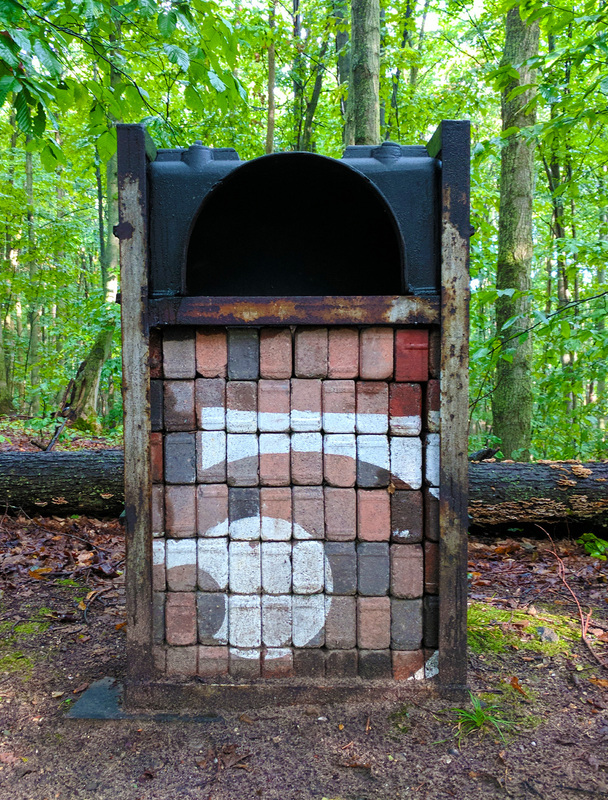 The contrast between nature and industrialism is where the artist feels this work makes a strong connection to Michigan and its history. The many natural resources of northern Michigan created a pathway for the development of shipping, iron smelting operations, lumbering and saw mills, copper mining, etc. With iron production specifically, the ovens were vitally important in removing impurities from the iron ore and were fed by northern Michigan’s lumber. In fact, these operations themselves provided a transition point from the natural to the industrial. While A.M. symbolically celebrates modern industrialism through its form and materials, it is also meant to remind us of our own manipulation and control of the environment.